These rocks, located on the Fort Belknap Indian Reservation in northcentral Montana, are pieces of Snake Butte, the intrusive igneous formation shown in the background. Although they're few and far between, pieces of the butte have been strewn in a line for over 30 miles (48 km) to the southeast of the butte. They were picked up by the Laurentide Ice Sheet as it flowed over the butte and then deposited on the prairie as the ice eventually melted. 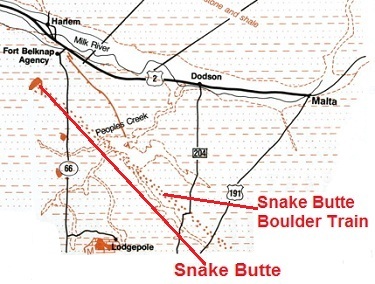 The line of boulders, called the Snake Butte Boulder Train proves that the glacier was diverted to the southeast as it encountered the Bears Paw Mountains. Rocks like this that were transported by glaciers and then deposited far from their place of origin are called erratics. The fact that rocks from northern Canada are also abundant in northern Montana, including several that can be found on top of Snake Butte, as well as striations found on top of the butte confirm that the ice was flowing toward the southeast as it moved through this area. Photo Details: Camera: Panasonic DMC-LX7; Software: iPhoto 9.6.1; Exposure Time: 0.0006s (1/1600); Aperture: ƒ/3.2; ISO equivalent: 80; Focal Length (35mm): 90.